Hi! Thanks for your awesome products! I have a little feedback on your needle from my local installer. She installs NFC chips from https://www.biohax.tech (remove link if you don’t want it there), but don’t at all mind installing others. When I approached her about installing my xM1+ chip, she said that that was no problem, but warned me that the needles from DT were somewhat dull. She was right, the implant in my left hand went in very smoothly (from the other supplier), but the xM1+ was much more difficult and required a significant force. I’m all done installing needle chips (flat chips next!) but it may be worth for the rest of the world to see if there is room for improvement on the needles? The needle from the xM1+ is bigger then the needle from the other chips. I don’t have it implanted yet (must wait for my next holiday - Austria is a nightmare to get implants - you need to travel to Germany. We heard this as well and conducted extensive testing. The result was that our needles were not dull, but lacked silicone based “needle lubricant”. We evaluated other supplier needles, piercing needles, etc. however we found that the only significant difference between our needles and biohax needles were the application of lubricant. The length, angle, and overall quality of the cuts made to the steel tubes used to create the needle bevels were, for all intents and purposes, identical. When we tested insertion forces for various needles on a silicone based suture training pad, the force was also nearly identical. Parts 2 and 3 are the actual cutting edges that perform the incision. Part 1 is typically not a cutting edge, and simply pushes it’s way into the incision in the skin. This is where the problem typically occurs. In all reported cases, it is “getting over this hump” which is difficult and requires much more force. The cutting edges (2 and 3) had no trouble at all getting under the skin, therefore the needle’s “sharpness” is not the issue. As I mentioned above, the issue is made worse through the combination of using a dry, unlubricated needle with skin that has been prepped with an alcohol based antiseptic. This is because alcohol draws away water and skin oils, and combined with the scrubbing action of the prep process, leaves the surface of the skin very dry and “tacky” to the touch (gloved touch). This “tacky” skin surface is then expected to accomodate a non-cutting bevel edge (part 1 of the needle), and this is where the force required to get past this part can be very high. Once in, the needle should have a slightly better time, however still being a dry steel tube pushing its way past skin that is now also extremely dry and devoid of any oils… it’s not a great experience. The inventory we have is almost all dry, however good news… we are working through this inventory and all new kits will use lubricated needles. The xM1+ that was recently re-introduced to the market does have lubricant applied to the needle. This is likely why @JennyMcLane reports no issues installing it, even though the needle is significantly larger than the typical x-series. I personally installed an xM1+ from the original run, and it was what I would categorize as “extremely difficult”, so I know first hand how difficult an unlubricated xM1+ needle install can be. The good news is, most piercers have their own needle lubricant or at least know about it. 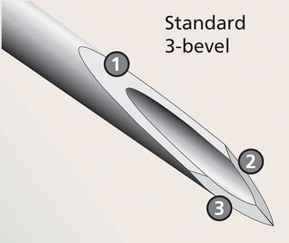 Many piercing needles come “coated” (lubricated) so they don’t require separate lube to be applied, but if you have any doubts you can ask that the professional apply needle lube to the xM1+ needle during installation. Thanks for a very thorough response!